Sometimes you just need to get off your beaten path. We use Shaw Boulevard as a key east-west corridor to live our daily lives. It's been a pleasure to see more and more investment on this street. Sure there are standout projects like the Shaw Theater renovation at Shaw and 39th. But, an equally welcomed sight has been construction dumpsters consistently lining the street. Iconic buildings are important, but so are the masses of brick residential beauties. This investment includes the much needed tuck pointing, new roofs and windows being installed that will be allow these buildings to be functional for another generation. Frankly, there was a lot of deferred maintenance and lack of investment on this street for years. It's a different place these days. I decided to check out a small student garden maintained by St. Margaret of Scotland school at Shaw and Lawrence; they recently installed a new sign and the place looks like it is well cared for and in use by the students. Great to see this kind of community on display on a street that is heavily traveled. On a whim, I headed a block north to De Tonty, a street I don't travel nearly as much, but studied and shared my thoughts on this high-profile street back in 2016. One of the points I made in that post was to argue De Tonty has undergone an historic transformation was the long-vacant corner at De Tonty and Lawrence. There has long been a sign announcing an exciting project called the Greenhouse Venture. NextSTL had reported on this as early as 2015. So as we sit here in 2018, I was curious where this project stands. 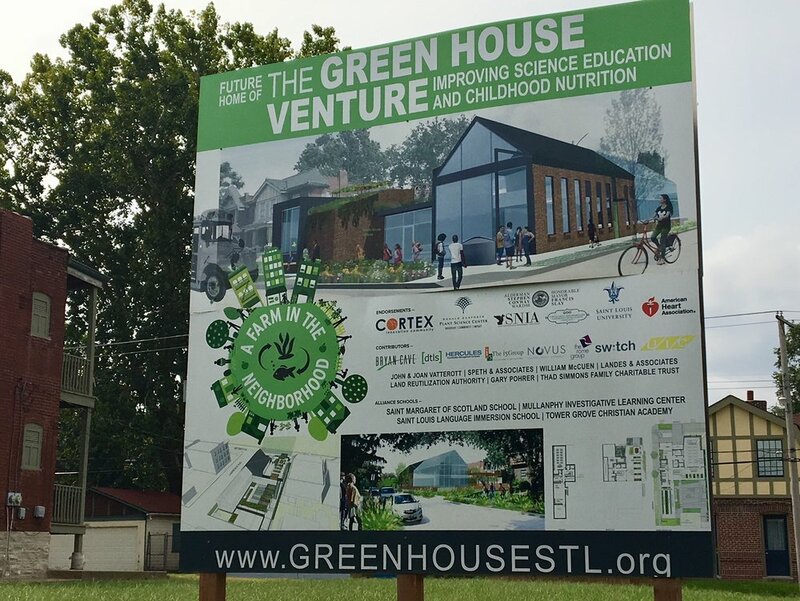 I reached out to Tower Grove CDC who connected me with Tom Purcell, the President of the Board of Directors for the Greenhouse Venture. Tom and I met at Kitchen House Coffee to discuss the latest news. Turns out there is a lot of work going on behind the scenes to build momentum for the project. First, this project will be a shining light on St. Louis’ rapidly improving schools that can help young parents feel more and more confident that they can find a way raising a family in St. Louis…turning back the tired narrative of having to move to the burbs to raise kids. The project will become a greenhouse, aquaculture facility and classroom dedicated to "improving science education and childhood nutrition", all part of an alliance of private, charter and public schools including St. Margaret of Scotland, Mullanphy, St. Louis Language Immersion School, Tower Grove Christian Academy and St. Louis University who will lead the operation with the input and collaboration from Harris Stowe University, St. Louis Community College and Washington University. More schools are welcome to join in the future to utilize the facility for extended learning. See that plaque Purcell is holding in the above photo? That’s a 2018 Focus St. Louis Emerging Initiatives award showing “What’s Right with the Region”. Focus St. Louis, is a local civic leadership program, recognizing the Greenhouse Venture for bringing top leadership together across a broad range of disciplines to bring a fantastic program one step closer to reality. Purcell and others have assembled an impressive group of movers and shakers to realize this most impressive endeavor. Momentum is building for the group. Not only have they received pro bono marketing and branding support from a local firm, they have launched a successful summer camp in Tower Grove Park to teach kids the basics of agriculture and bioscience mixed in with fun and recreation. They have been socializing the project at many different levels including media, local academia and corporate & personal fund raisers. In fact, you can now make a donation on the Greenhouse Venture website. Fundraising will be a key step in the process, the $4M project already has a respectable treasury from initial donations that will allow the group to proceed with confidence. Obviously, fundraising will correlate with construction groundbreaking and project completion. Another major step forward is a lease of ~3.5 acres of land from MoDOT on the south elevation of the I-44 embankment. The lease, procured by the venture, will open the door for construction of a tiered garden across from the greenhouse/classroom facility. This will include rows of five tiered raised bed gardens, including an ADA accessible one nearest De Tonty. Trees and bushes will selectively be retained (~80% of current trees will remain). Art sculptures will bookend the embankment garden to help with place-making and interest from the streets/sidewalks. Purcell claims this project will be a first for the state of Missouri in utilizing an Interstate embankment for learning space. I learned more about the basics of the venture which in my humble purview is noble in every regard. Taking a long vacant (~20 years) LRA property off the city books to bring a creative new educational experience for many schools in the city to benefit. Not only will the greenhouse teach young students the value, joy and health benefits of growing your own food, it will include a closed loop, sustainable system for aquaponic fish breeding that uses the waste produced from the fish to fertilize the plants with hydroponic, soilless beds and vertical plant growing techniques. This will take place within the two-story, 8,000 square foot main building, complete with indoor classroom space. Outside plans include a weather station, ozone garden, fruit garden, pollinator garden, and aeroponic growing on a roof-top terrace. So what do you do with all that fish and produce? Purcell explained that initial plans call for the St. Louis University’s Nutrition and Dietetics program to distribute the healthy, locally produced food to the public school’s meal program. Additional bounties can be sold in local farmer’s markets. This venture has the potential to be a shining light on community and St. Louis school collaboration to build something truly unique. The idea of trying to break down the barriers of fresh food to children, helping curb obesity and junk food culture is one that can change lives. Keep your eye on this corner at De Tonty and Lawrence and the embankment gardens across the street on the I-44 embankment. Projects like these bring hope that we can work together to bring the best and the brightest in the region together to influence the educational and nutritional systems in St. Louis. Newer PostCompton Heights - A Completely Developed Neighborhood?